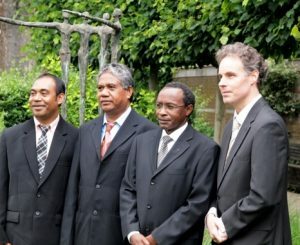 The General Board of the Brothers CMM is seated in Tilburg, the city where the congregation was founded. Since the General Board is an international board, the Generalate community is an international community. The home of the General Board is called ‘Generalate’. i.e. the seat of the General Board. In this building also various supportive services are located, such as the CMM archives, the Brothers CMM Museum, and also the central administration and communication office. Part of the building is rented out to foundations that are closely affiliated with our tradition. The Generalate also functions as a guesthouse for brothers from abroad visiting the Netherlands, for example for international meetings, studies or family visits. The Generalate community is an international community: you will be welcomed in various languages!